Think customer personas – those detailed representations of the different segments of your target audience. Fueled by data-driven research that map out the who behind the buying decisions of your products or services, customer personas can help inform everything from more effective copy to product development. If you answered, “it’s been a while” or “never,” you need to keep reading. According to a recent study by the Edelman Group, brands are failing to understand some of the fundamental motivations and concerns their customers have. Brandshare, Edelman’s consumer marketing study, surveyed 11,000 people across 8 different countries who have taken part in at least one brand engaging activity (like following a brand on Facebook) in the previous year. The study found that 51% of respondents feel brands are underperforming when it comes to asking about their needs. 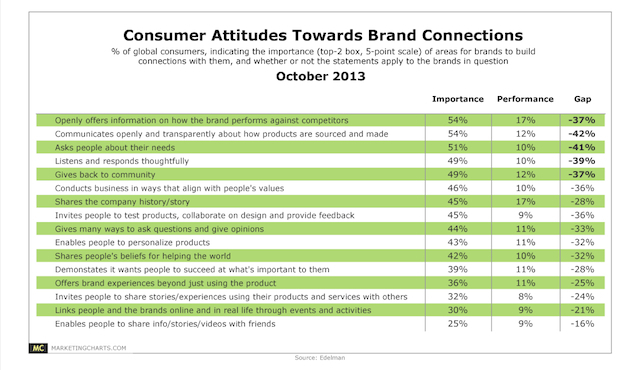 Only 10% consider brands are doing this well. The above graphic makes it clear the considerable gap between consumer expectations and companies’ ability to match them. 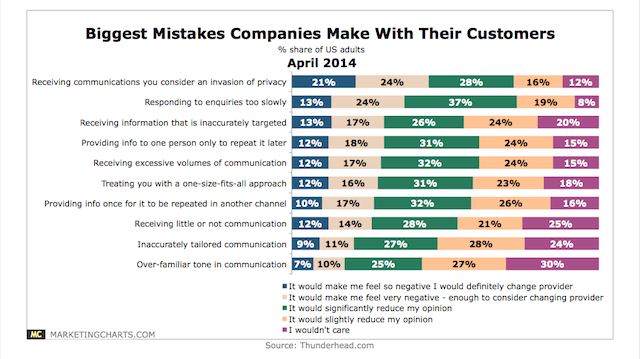 The customer engagement specialist, Thunderhead.com, conducted a similar study of U.S. consumers. After interviewing over 2,000 adults, they found ¼ would switch to a different provider after one negative experience. Close to 1 in 5 would sever ties feeling they could never re-establish trust after a significant negative experience. As the data shows, too many people are getting fed up with how businesses are interacting with them. With only 6% of senior executives believing that their companies understand their customers’ needs extremely well, it’s no wonder why customer acquisition and retention has become a substantial problem. 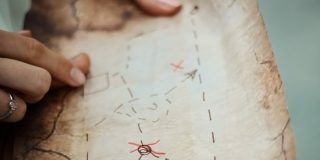 Patching together actionable information about your customers with gut feelings, good intentions and some duct tape is not a recipe for conversion success. If the above studies aren’t enough to make you start quivering in your boots, take a look at the debacle of JC Penney’s 2012 rebranding. Within a month of taking the helm as CEO at the retailer, Ron Johnson launched a radical rebranding. 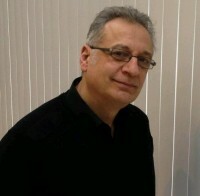 He not only changed the look and feel of the stores – getting rid of lucrative JCP private label brands, replacing them with designer inspired ones priced too high for most customers – Johnson instituted a complete overhaul of how the company did business. JC Penney’s went from a sales model based on constant coupons and markdowns to “every day low prices.” It was a disaster. 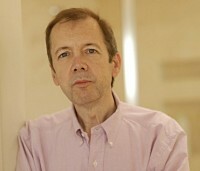 Sales collapsed within months of Johnson’s takeover. “I thought people were just tired of coupons and all this stuff. The reality is all of the couponing we did, there was a certain part of the customers that loved that. They gravitated to stores that competed that way. 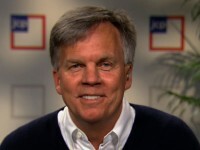 So our core customer, I think, was much more dependent and enjoyed coupons more than I understood.” Ron Johnson to Businessweek. As the man in charge of Apple’s retail stores previously, he blindly instituted a plan based on what worked elsewhere without testing and apparently without taking into account what drove his customer base to shop. With all this discussion of the mistakes, companies are making in not understanding their customers’ concerns and motivations, the argument for using a tool such as customer personas based on data and testing seems obvious. In case you’re unfamiliar with the term, let’s begin with a definition from one of the leading experts in the field of buyer insights research. In essence, personas are fictional representations of segments of buyers based on real data reflecting their behaviors. 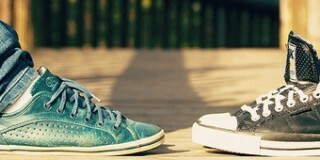 Their purpose is to put the people behind company decision making in the shoes of the customer. Let’s add to that “stuff” that’s essentially useless for the business goal you’re attempting to achieve, i.e. increased website conversions or in store sales. While some basic demographics information such as gender and age may be applicable, other very specific attributes (what the family dog eats, unless you’re selling dog food) gleaned from research or anecdotes are useless. 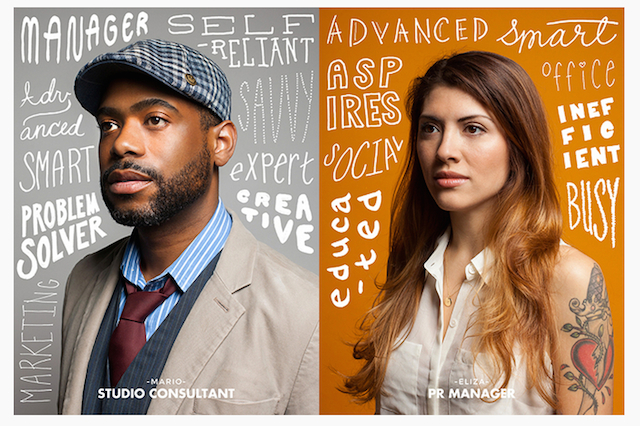 MailChimp created graphics with images of real people to represent the different segments of their customer base. Customer personas can be as basic or complicated as you’d like. They can take various forms; but at the end of the day, their utility lies in how effective they are at creating a clear picture of what drives the different types of buyers of your products or services. Behavioral drivers – These encompass your customers’ goals, what they want to accomplish, their journey to finding your business. Obstacles to purchasing – Take into consideration the hesitations and concerns your customers have. How do they view your product or service and how does that impact how much information they need to make a decision? Mindset – Your customers come to the buying experience with expectations and preconceived notions. Are they shoppers who want the thrill of the bargain or expect a more refined experience? Selling a weight loss program will be more emotionally charged than, say, selling routers. 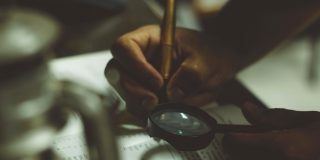 Conducting surveys online or off with open-ended questions are critical to understanding how your customers frame their motivations and needs. The goal is to get inside your customer’s heads to make sure your personas are based on what real people think, not just your idea of what they think. Consider asking between 7 and 10 questions designed to give you the best insights based on their behavioral drivers, obstacles to purchasing, and mindset as described above. Depending on your business, the questions will vary. But, the end goal is always the same – getting actionable information that serves your needs. What problem does our product/service solve in your life? We’ve written quite extensively about this earlier this week, you can get more information here. Talking to your existing customers can provide valuable information into their buying habits, what motivates them, and the words they use to describe your product or service. While conducting interviews can be expensive and labor intensive, the answers can be illuminating. You can go back and ask your respondents to elaborate, getting details not available through surveys. Sean Murphy has some great tips for conducting customer interviews, you can check them out here. These include such things as Qualaroo pop-ups. 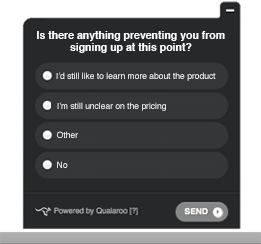 Qualaroo is a third party application that allows you to have a single question pop up on your site at a designated time. It is a particularly good tool for finding out why your customers are not completing a purchase. The question to ask depends on your overall goal. Do you want to understand if your site or products/services on your site are meeting their needs? 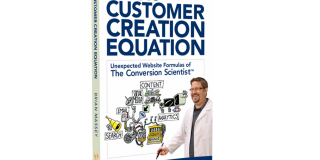 Or do you want to understand what potential sources of friction are keeping customers from buying? Experiment with your question to see what gets the most responses and responses with the most insights. If “Why didn’t you complete a purchase today?” wasn’t as successful as you had anticipated, ask “Do you have questions you weren’t able to answer today? Start segmenting your users based on commonalities you find. Look first to intent then to possible hesitations and the ways in which your customers are susceptible to persuasion. 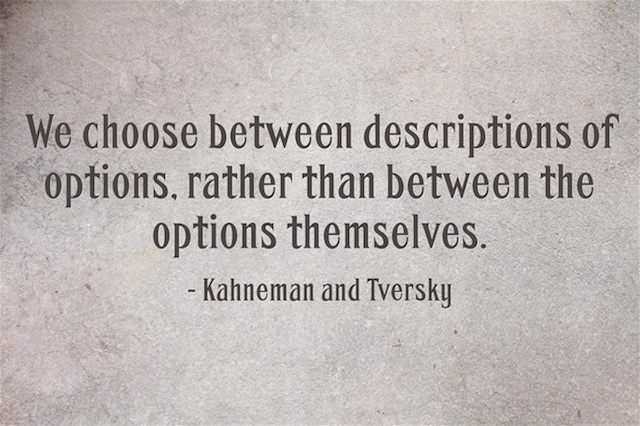 You may find 2 personas that you can clearly define or 4. The number depends on what the research will support. 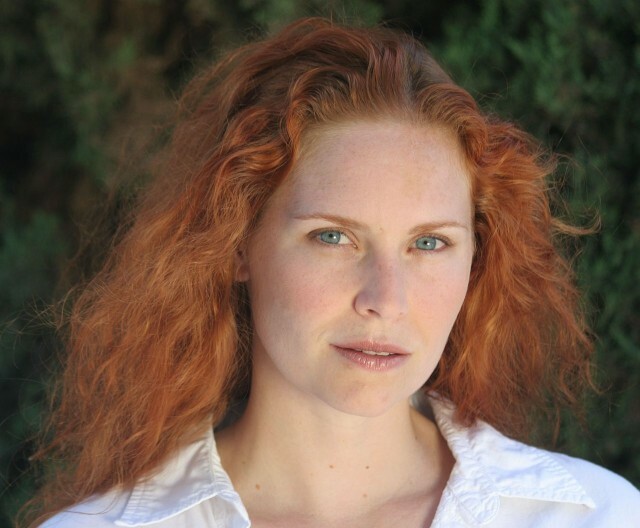 Beth, a 35-year-old woman who is worried about her family’s exposure to chemicals in the environment. She cares about reducing her carbon footprint and is willing to pay a little extra to make sure she’s buying a product that’s sustainable. What are Beth’s behavioral drivers? These products give Beth a sense that she’s doing something right for her family and the environment. She can easily order them online which works for her hectic schedule. What are Beth’s obstacles to purchasing? She has concerns that all of the information about where the ingredients are sourced are correct. She worries about the packaging that houses the products and how they will be shipped, i.e. if they contain harmful substances. What are Beth’s expectations from the buying experience? The presentation is important. She wants a product that reflects her values. Getting a bargain is not as important as getting a product she trusts. While putting a name and an age isn’t a must on your personas, it does help with visualizing a person behind the persona. Beth feels real as opposed to Persona #1. You and your team may be more likely to ask yourselves what that particular component of your customer base needs and wants when creating things like copy or design. You’ve created a few personas with your qualitative research – segments based on user goals, behaviors, and attitudes. By diving into your website’s Google Analytics you can round out your personas with quantitative findings. With the new advanced segmentation features from Google Analytics, businesses can more accurately determine individual user behavior on their websites. Brian Massey touches on this a little more in, “7+ Under-Utilized Google Analytics Reports for Conversion Insights” & is something we plan to examine further in future articles. You’ve spent the time developing your personas, validating them with your research. Now, it’s time to rely on them to help you make decisions to test. This is where your own findings of what motivates and distresses your customer base intersect with behavioral science. Here’s just one example. 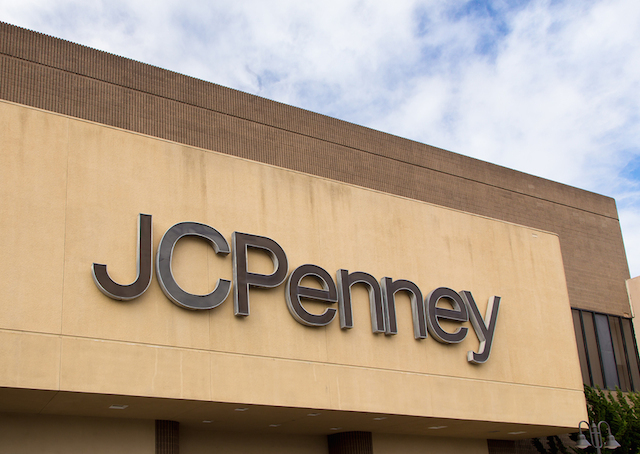 Remember the cautionary tale of Ron Johnson and JC Penney? To him, a pricing model that revolved around “fair and square” and relative transparency made perfect sense. To his entrenched customer base, not so much. 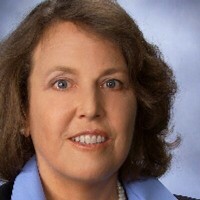 The JC Penney shopper expected to see markdowns and to use coupons. When they no longer could view prices from the retailer through the lens they had become accustomed to, no matter the rationality/irrationality of the vantage point, they no longer saw the value. Kahneman and Tversky ascribed this economic behavior to what they called Prospect Theory. People evaluate outcomes relative to some reference point – usually involving their current situation. Gains and losses are viewed through the prism of perceived outcomes instead of absolutes. 68% of the respondents were willing to make the extra trip to save $5 on the calculator. When the question was posed to another set of respondents but the pricing reversed – the calculator cost $125 and the jacket $15 with the calculator being on sale for $120 elsewhere – only 29% of people were willing to drive across town. The savings is the same but the framing of the question different. $5 is $5 except when placed within the context of the savings coming from the higher priced item. If only, Ron Johnson had spent a bit of time thinking about that. Facebook fields user complaints to the tune of 4 million conversations a week. In an attempt to get people to communicate with each other instead of just receiving anonymous complaints, they changed their reporting messaging around one set of users. 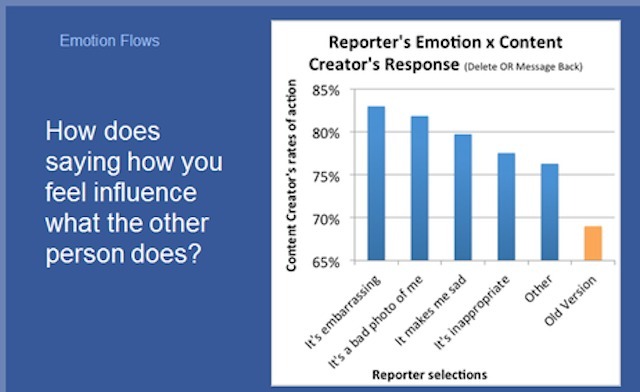 They focused in on teenagers of both genders and age ranges to understand what were the biggest obstacles to reporting a photograph posted by another person they wanted to be removed. Facebook’s goal was to increase their automated complaint form conversions, thereby getting resolutions without employee interventions. After talking with different segments of teenagers, they found the word “report” as a click trigger caused undue friction. Kids didn’t want to get their friends in trouble. When they changed the phrasing to “this post is a problem,” complaints increased. As well, Facebook tested a change in the form allowing the person complaining to name the recipient and the emotion that got triggered. 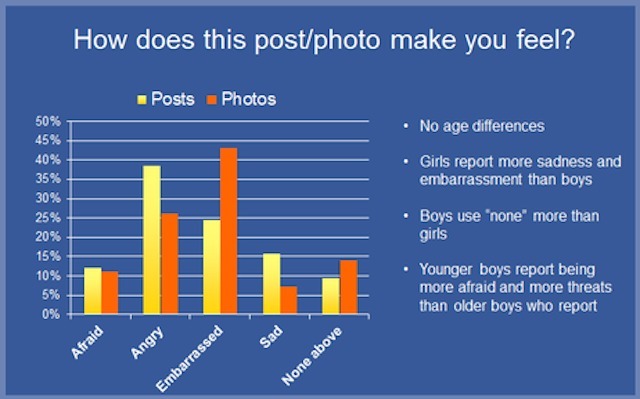 According to the data, they found nearly an 85% likelihood that the originator of the photo post will reply back to the person offended or take the photo down when the words “It’s embarrassing” are used. This is a good example of how you can take your qualitative research that informs your personas, apply it to an area of your business, and then test it using quantitative means. What Happens When You Start With The Quantitative Data? UK online watch retailer, Watchfinder, took a deep dive into their Google Analytics to understand how to better engage with their site visitors. They found that less than 1% of their visitors completed a transaction on the first visit to the site. According to a case study on the Google Analytics blog, Watchfinder decided to set about a remarketing campaign using Google ads. They started by gleaning customer segment insights from their analytics by creating lists based on user language, location, and what stage of the purchase funnel they were in. In conjunction with a traffic performance analysis, they realized that much higher engagement and conversion rates were coming from particular ISP addresses in the London Financial district. By re-targeting these site users with messages tailored specifically to employees at the large investment banks, they were able to increase the average order value on the site by 13% with an overall return on investment after 6 months of 1,300%. Here is a case where the quantitative data can be instructive in its own right – shedding light on a subset of the customer base. It would be interesting to see how adding this data to any qualitative persona modeling done could even better define their marketing efforts. Customer personas are a tool. With all tools, they are only as good as the people using them. They can provide tremendous insights into how to create better user experiences, persuasive copy, or pricing models. The key is to model them out of data that serves whatever goals you’re attempting to attain. Most importantly, remember your personas should reflect real people with real motivations, desires, and concerns. When we lose sight of the human element, the customer isn’t far behind. I like where you were going with this.. however I think also trying to frame things around Jobs to be done would be more beneficial. Interesting. Thanks for sharing that link. Is it me… Or haven’t direct and database marketers being doing this for years. We call it segmentation! Yes…but from what I have seen in practice is that personas can go a little deeper than [ex] running the customer data through PRIZM and letting the factoids drive the action. And for a lot of direct marketers, that’s as far as they go with segmentation. Personas tend to be developed by those that add the surveys and interviews to the PRIZM data in order to get more of a narrative from the mouths of the audience. For some, putting all this together is just common practice…for others, pieces of the above are being called “segmentation” and/or “personas”. Nice article Jen. Great to see a data approach to this important topic.